Help your little ones recognize the joy, responsibility, and importance of being baptized. 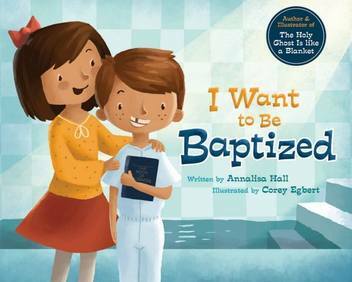 I Want to Be Baptized – from the same author and illustrator who brought you The Holy Ghost Is like a Blanket – depicts what baptism really means for children’s lives by comparing it to objects they remember and relate to. Turn to these heartwarming illustrations and meaningful analogies next time a child asks you about baptism. I read my children I Want To Be Baptized at the breakfast table. As a read aloud it is a bit long, with each paragraph ending “and what else?,” so about 3/4 of the way through I stopped. All of my children urged me to keep going, then one took over reading it aloud, which shows me it is a good book! They enjoyed that the author compares those things included in baptism, like covenants, to examples in the every day world. Our oldest commented that “it teaches everything you need to know to be baptized.” With beautiful illustrations by Corey Egbert it is bright and attention holding. We loved it and look forward to reading the authors other book The Holy Ghost is Like a Blanket.